Jeff Lynne’s ELO will be joined by Tom Chaplin on their run of dates in the UK this summer, with the Shires joining the bill at London's Wembley Stadium and Hull's KCOM Stadium. In addition to the London and Hull dates, the tour also hits Sheffield Arena and Glasgow's SSE Hydro between June 21 and July 1. Tom Chaplin, known for being the vocalist in Keane, put out his solo album 'The Wave' last year and has his own headline tour lined up in May. The Shires, meanwhile, released 'My Universe' last year and have a string of festival appearances lined up this summer. Lynne and band released 'Alone In The Universe' in 2015. 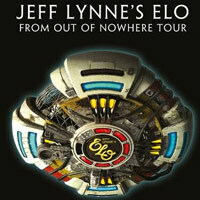 Click here to compare & buy Jeff Lynnes ELO Tickets at Stereoboard.com. Photo: Carsten Windhorst Jeff Lynne's ELO have lined up dates for a summer trek. Photo: Carsten Windhorst Jeff Lynne's ELO have added a fourth London date to their autumn arena tour. Photo: Carsten Windhorst Jeff Lynne’s ELO have added three extra dates to their autumn arena tour. Jeff Lynne’s ELO tickets go on sale at 9am today, priced £50.00 plus fees.